Fulham forward Andre Schurrle could feature after suffering a virus that has kept him out for five matches. Tim Ream and Jean Michael Seri will be assessed following long journeys back after international duty, while Alfie Mawson is still out. Manchester City are strengthened by the return of Kevin de Bruyne, Fernandinho, John Stones, Benjamin Mendy, Vincent Kompany and Nicolas Otamendi. Fabian Delph and Claudio Bravo are City’s only injured players. Manchester City have won the past six league meetings. City have scored 10 goals without reply in their last three matches with Fulham. It’s almost a decade since Fulham beat Manchester City – a 3-1 Premier League win at the Etihad in April 2009. Manchester City have scored in all of their last 23 matches against Fulham. Manchester City have won their last six league games, scoring 16 and conceding two goals. City have scored 13 goals in their last three games in all competitions. They have the best form of any Premier League team over the last 10 matches, dropping just three points out of a possible 30. Pep Guardiola’s side have scored 79 league goals this season, more than any other top-flight side. Raheem Sterling has scored eight goals in his last four starts for club and country. Only three of Sergio Aguero’s 18 Premier League goals this season have come away from home. Brighton manager Chris Hughton will make a late decision on whether to involve Florin Andone, who has missed two matches with a thigh problem. Midfielder Pascal Gross remains sidelined by a pulled hamstring. Danny Ings is in contention to return for Southampton after eight weeks out with a hamstring injury. Mario Lemina could feature for the first time in 2019 after recovering from an abdominal problem, but Shane Long is still unavailable. All three Premier League meetings have ended as a draw. Brighton recovered from two goals down to earn a point in September’s reverse fixture. Southampton won 1-0 at Brighton in the EFL Cup in August and their only defeat in nine meetings came in the Championship seven years ago. Burnley’s Johann Berg Gudmundsson is a fitness doubt after suffering a calf injury while playing for Iceland. The club’s other international players all returned unscathed, leaving Steven Defour and Aaron Lennon as their only certain absentees. Wolves will be without defender Ryan Bennett, who serves the final game of a two-match suspension, so Romain Saiss will once again deputise. Bennett is the only player unavailable to head coach Nuno Espirito Santo. Burnley’s 1-0 loss at Molineux in September’s reverse fixture ended a four-match unbeaten run against Wolves in all competitions. Wolves have won seven successive top-flight meetings, including all three in the Premier League. Burnley are without a top-flight home victory against Wolves since 1963, losing five of the subsequent nine games. Crystal Palace are hopeful Wilfried Zaha and Aaron Wan-Bissaka will be available following hamstring injuries. Bakary Sako has overcome an unspecified problem but Mamadou Sakho remains on the sidelines after knee surgery. Huddersfield pair Jonathan Hogg and Christopher Schindler are back after a rib injury and illness respectively. Fit-again midfielder Danny Williams could make his first appearance since December but loanee Jason Puncheon is ineligible to face his parent club. Laurent Depoitre, Demeaco Duhaney and Adama Diakhaby are among Huddersfield’s other absentees. Crystal Palace have won the past three meetings in all competitions without conceding a goal. Huddersfield are looking to record successive away league victories over Palace for the first time. The home side has never scored in seven previous top-flight meetings. Leicester’s club captain Wes Morgan is likely to replace the suspended Harry Maguire on Saturday. Marc Albrighton has resumed training after a hamstring injury and it is hoped he will play again this season. Bournemouth trio Junior Stanislas, Adam Smith and Dan Gosling could all be in contention to return from injuries. Stanislas has missed six matches with a hip problem, while Gosling and Smith have been out with respective knee and thigh injuries. Leicester are yet to beat Bournemouth in the Premier League in seven attempts, although five have been drawn. It’s their longest run against any team in the division without ever winning. However, Bournemouth are winless in five away league visits to Leicester since a 1-0 second-tier victory on Boxing Day 1988 under Harry Redknapp (D3, L2). New Manchester United manager Ole Gunnar Solskjaer will assess the players who withdrew from international duty because of injuries. Marcus Rashford, Luke Shaw, Nemanja Matic and Anthony Martial could all be fit, but Romelu Lukaku is expected to remain sidelined by a foot problem. Eric Bailly is a doubt with a head injury, while Ashley Young is available after serving a ban in the FA Cup. Watford’s former United midfielder Tom Cleverley is out with a calf injury. Jose Holebas has overcome the problem that forced his substitution during the FA Cup win against Crystal Palace. Manchester United have won 15 of the past 16 meetings in all competitions, losing the other game 3-1 in the Premier League at Vicarage Road in September 2016. Watford are winless in all 11 away league visits to Manchester United (D2, L9). However, they did beat United at Old Trafford in a League Cup tie in October 1978. Watford have lost 16 of their 17 away games in Manchester since beating City 2-1 in April 1987. Manchester United have earned the most Premier League points since Ole Gunnar Solskjaer replaced Jose Mourinho. Their tally of 32 is one more than Liverpool over the same period. United are unbeaten in 12 league matches at Old Trafford since defeat by Tottenham in August (W7, D5). That is also the last time they lost consecutive top-flight games. The Red Devils haven’t lost three successive games in all competitions since September 2016, a run which culminated in a league defeat against Watford. They have kept just two home clean sheets in the Premier League this season – only Fulham, with one, have a worse record. Solskjaer’s side have won only two of their 11 league fixtures this season against sides currently in the top nine (D4, L5). Marcus Rashford and Anthony Martial have each scored nine Premier League goals this season, with Romelu Lukaku and Paul Pogba already in double figures. United haven’t had four players score 10 league goals or more in a season since 1995-96 (Scholes, Cole, Giggs, Cantona). West Ham midfielder Samir Nasri is a major doubt because of a calf injury. 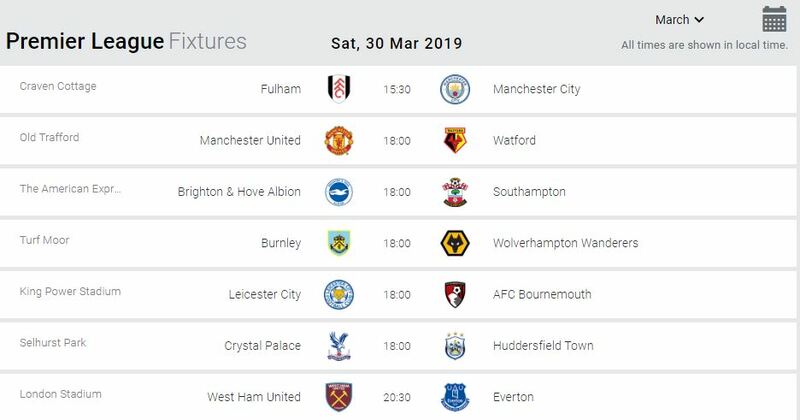 The Hammers are already definitely without five injured players: Winston Reid, Andriy Yarmolenko, Jack Wilshere, Carlos Sanchez and Andy Carroll. Everton centre-back Yerry Mina is set for a spell on the sidelines after suffering a hamstring problem while on international duty with Colombia. Lucas Digne and club captain Phil Jagielka are available after injury, while Andre Gomes is being assessed. Loanee Kurt Zouma returns after missing the win over parent club Chelsea. Everton could lose three straight league matches against West Ham for the first time since a run of four between April 1929 and December 1931. The Toffees have won 24 Premier League fixtures against the Hammers, more than versus any other opponent. Cardiff will be without Callum Paterson for the rest of the season after he was injured playing for Scotland. Sol Bamba is also a long-term absentee, while this game will come too soon for Jazz Richards. Chelsea will monitor Ruben Loftus-Cheek and Ethan Ampadu, both of whom missed international duty because of back problems. Callum Hudson-Odoi will hope to start his first Premier League game after impressing for England in Montenegro. Davide Zappacosta’s ankle problem will also be assessed. Cardiff have not defeated Chelsea in the top flight since 1961. That year, they beat the Blues 5-2 at home on 6 September and then, just two weeks later, won 3-2 at Stamford Bridge. The Bluebirds’ most recent win against Chelsea was 2-1 at Ninian Park in the third round of the League Cup in October 1986. The Blues have lost six of eight Premier League games this season when they have conceded the opening goal, with their only victory coming in September’s 4-1 win against Cardiff. Chelsea have lost four of their five top-flight away games in 2019, with the aggregate score in those four defeats being 14-0. Prior to the weekend, only Fulham (five defeats) had been beaten more often on their travels this calendar year. Chelsea have not kept a Premier League clean sheet outside of London since beating Burnley 4-0 on 28 October. Their only defeat in 17 previous Premier League games against Welsh opposition came at Swansea in April 2016 (W12, D4). Eden Hazard has scored five Premier League goals in three appearances against Cardiff, all of them at Stamford Bridge. Gonzalo Higuain has scored three goals in seven Premier League games, with all of those strikes coming against teams in the relegation zone: two versus Huddersfield, one against Fulham. N’Golo Kante is set to make his 100th league appearance for Chelsea. Liverpool will monitor full-back Trent Alexander-Arnold, who withdrew from England duty with a back problem. Xherdan Shaqiri will also be assessed after missing Switzerland’s two games with a groin problem, but this match comes too soon for Joe Gomez and Alex Oxlade-Chamberlain. Tottenham are without Eric Dier, who suffered a muscle injury in England’s win against the Czech Republic. Harry Winks remains sidelined but Kieran Trippier is back in contention. Serge Aurier was forced off after half an hour of Ivory Coast’s victory against Rwanda last weekend because of a hamstring problem and is not available. Liverpool have only lost one of their past 13 league and cup games against Spurs, winning eight of those matches. Tottenham’s only victory in their last 24 league games at Anfield came in May 2011, when Rafael van der Vaart and Luka Modric were on target. Liverpool have lost just one of eight league matches this season against the other sides in the top six, although four of those encounters have been drawn. Victory would give them their highest points total at this stage of a top-flight season. The Merseysiders are unbeaten in 36 Premier League home games, winning 26 and drawing 10. If the Reds avoid defeat on Sunday they will set the joint-second longest unbeaten run at home in the competition’s history, bettered only by Chelsea’s 86-match sequence from 2004-2008. Liverpool have conceded six goals in their five Premier League home games in 2019, as many as they had in their previous 17 at Anfield. They have won the last four Premier League home fixtures in which they conceded the opening goal – the first side to do so since Chelsea (from 2013 to 2015). Sadio Mane has scored in each of his past six league games at Anfield, netting eight goals in total. Mohamed Salah has just one goal in his last 10 games and has failed to score in his last seven appearances, his longest drought since joining Liverpool. Roberto Firmino has failed to net in eight of his past nine games for the Reds, although he scored twice against Burnley in his most recent match at Anfield. Spurs are without a victory in their last four Premier League games (D1, L3). It is seven years since they last went winless in five top-flight matches within a single season. Mauricio Pochettino’s side have lost five of their last six away matches in all competitions, conceding twice in each of those defeats. They could lose four consecutive away league fixtures for the first time since December 2008 to January 2009 under Harry Redknapp. Tottenham have lost five of their eight league games this season against the other sides in the top six (W2, D1, L5), keeping just one clean sheet. Spurs have earned 33 points away from home this season – one shy of their Premier League record tally. Harry Kane has 11 goals in his last 12 Tottenham appearances in all competitions, and he has scored in three of his four Premier League appearances at Anfield. Arsenal will be without the suspended Lucas Torreira when they host Newcastle in the Premier League on Monday. Aaron Ramsey is expected to be passed fit, having been troubled by his left thigh, as is Nacho Monreal, who has returned to training after hurting his right calf. Granit Xhaka also faces a late fitness test on a muscle injury but striker Danny Welbeck is out with an ankle injury, while knee issues continue to sideline Hector Bellerin and Rob Holding. Schar will miss out through suspension. The central defender completes the second leg of a two-match ban after reaching 10 bookings for the season, but would almost certainly have sat out anyway after being knocked unconscious in a clash of heads during Switzerland’s 2-0 Euro 2020 qualifying win over Georgia last Saturday. Skipper Jamaal Lascelles has recovered from the knee problem which kept him out of the 2-2 draw at Bournemouth last time out, leaving only Sean Longstaff (knee) on the sidelines. Arsenal have won their last six home Premier League games against Newcastle United, scoring 18 goals and conceding just five. Newcastle have lost 11 of their last 12 Premier League matches against Arsenal, winning the other 2-1 at St. James’ Park last season. Only against Manchester United (28) have Newcastle lost more Premier League games than against Arsenal (27). Arsenal have won all six of their home league matches in 2019 and are one of only three of the 92 English league clubs yet to drop a home point this calendar year, along with Manchester City and Sheffield United. This will be Newcastle’s 15th consecutive Premier League game on a Monday away from home – of the previous 14, they’ve won two, drawn one and lost 11. Arsenal have won their last nine Premier League home games. They last won more consecutively at home within a single season back in 1997-98 (10). Newcastle have lost 17 of their last 23 away Premier League games in London (W3 D3) and are winless in their last six visits to the capital (W0 D2 L4). Arsenal’s Mesut Özil has had a hand in four goals in four Premier League games against Newcastle United (3 goals, 1 assist). Newcastle boss Rafael Benitez has taken just two points in his seven away Premier League games against Arsenal (P7 W0 D2 L5). Alexandre Lacazette has scored 73% of his Premier League goals for Arsenal in home games (19/26). Of the 42 players to have scored 10+ goals in the competition for the Gunners, only Tony Adams scored a higher ratio at home (83%).